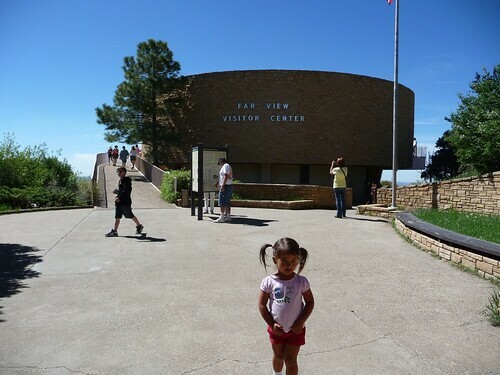 Mali Mish – Day 111: Mesa Verde National Park. 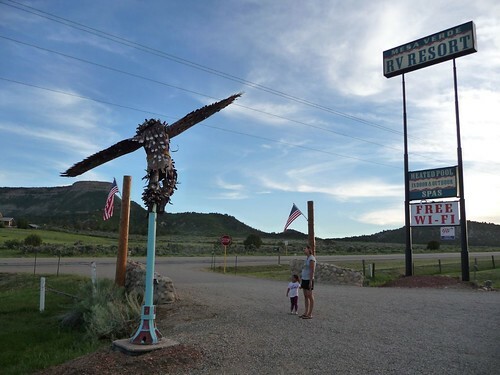 After dinner in Durango last night we headed west towards Mesa Verde National Park and got a spot at the Mesa Verde RV Resort just outside of the park. We looked long and hard at our options and we crossed our fingers in hoping that the RV Resort had a decent WiFi connection since our Sprint 3G card is hopelessly out of range. So far we are doing alright. The site had hookups and the WiFi signal worked well enough for us to get some work done so we could head out for some sightseeing in the morning. 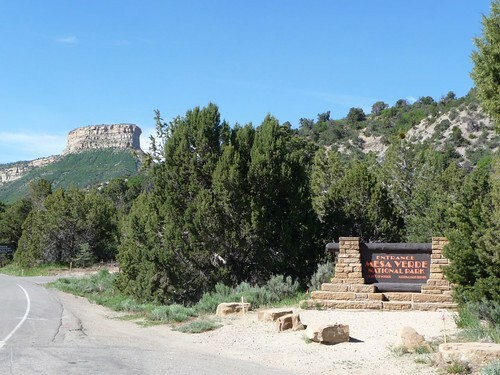 Mesa Verde National Park is the destination we had in mind for the day. Being at over 6,000 feet in elevation, the air up here is crisp and fresh. Even though the weather is slightly on the warm side, we could not complain from the heat we had just escaped in the lower elevations of New Mexico and Texas. 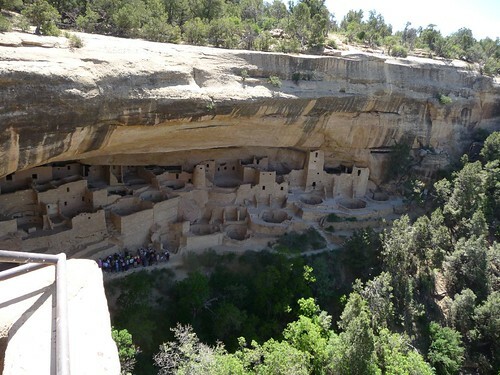 Mesa Verde National Park is known for the cliff dwellings that were once home to the Anasazi people in this area. 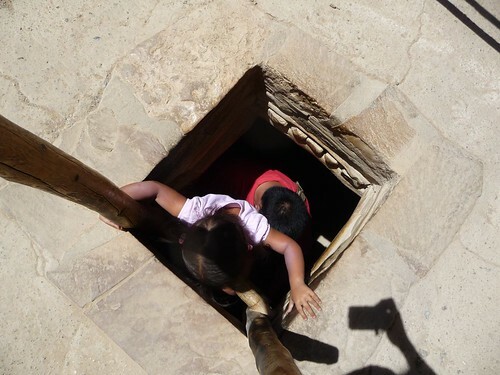 There are many theories to why these ancient Pueblo people decided to make their homes in these precarious locations. 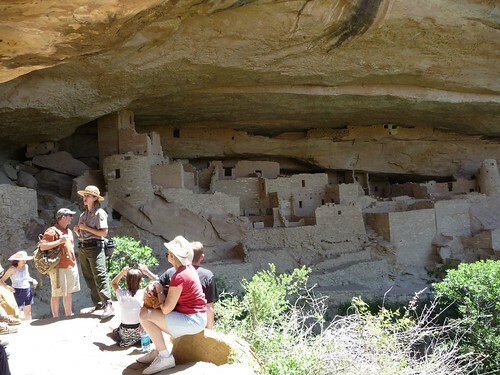 It is generally believed that the cliff dwellings we simply a transitional period for many of the settlers as they moved away from the northern latitudes that were devastated by the climate change of the 12-13th century. The plateaus above the cliffs provided reliable sources of rich soil for agriculture and the one-sided cliff dwellings provided safety from potential enemies. First stop from the visitors’ center is the famous Cliff Palace. This particular site is by guided tour only so we waited for the group ahead of us to clear up some room before we made our way down. 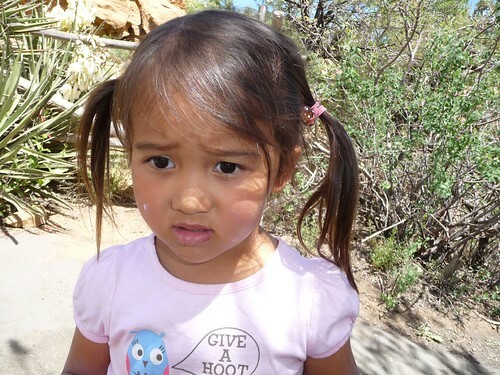 The name Anasazi is the name people have used for the ancestral Puebloan people for many ages. However the term has fallen out of favor as it contains a semi-derogatory definition. 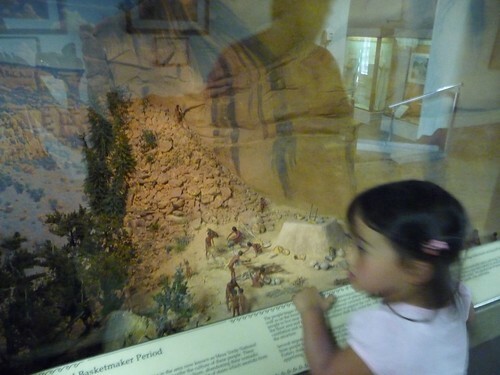 The term Anasazi is Navajo for ‘Ancient Enemy’. I guess no one likes to be referred to as the enemy. Maybe besides Chuck D and Flava Flav. The Cliff Palace is quite an amazing sight. 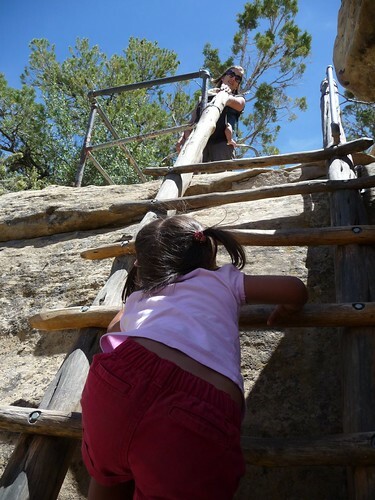 The path down to it involves some very steep rock steps and makeshift ladders. Marlene carried Mila in the Ergo carrier while I climbed right by Ava making sure she didn’t miss a step. 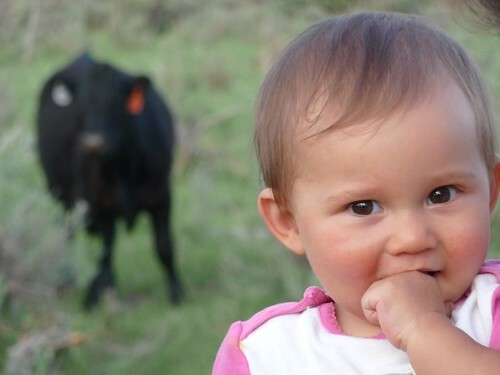 The original inhabitants had it even harder than we did. The path down to the Cliff Palace today is a 8-lane highway compared to how they use to get down there. 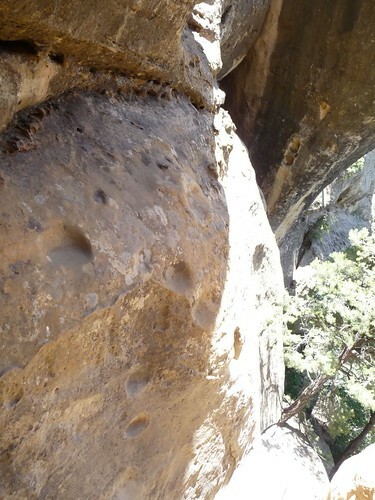 People basically used cracks in the rocks and small hand and foot holds to scale down the side of the rock faces to get down. 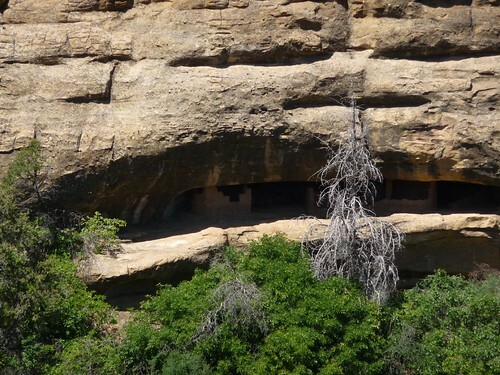 Here is one of the smaller cliff dwellings across the canyon from Cliff Palace. There are hundreds of these smaller ones scattered across the area. 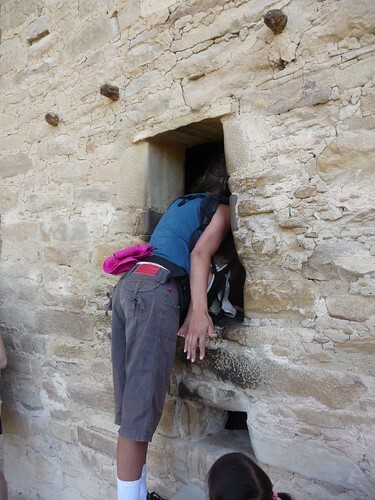 I don’t know how people got in and out of these little holes on the wall. Ava is a trooper and did awesome climbing up and down all of the ladders. Each group has a ranger as a guide who is there to help with navigating the site, tell us some background and interesting information as well as answering whatever questions we had. We actually got to peek our head into the window on the bottom floor of the two story building. 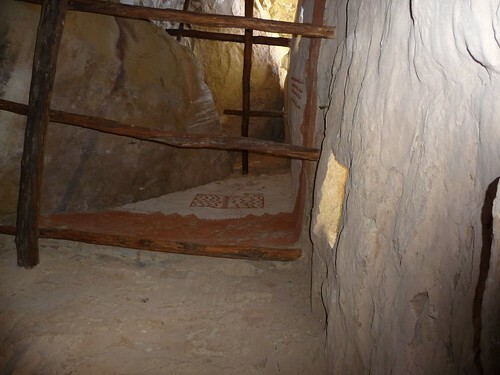 When you look up, you can still see one of the original wall paintings left by the Puebloan residents from 800 years ago. 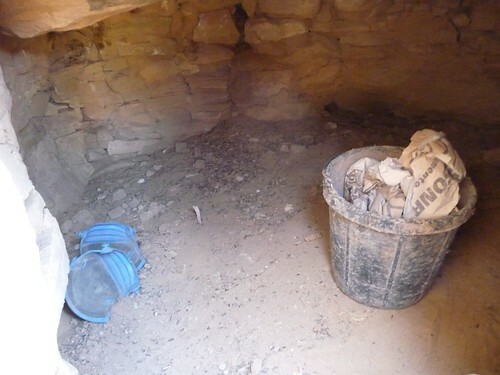 And in another small shelter, we found some ancient building materials that was left by an Anasazi who apparently knew where a Home Depot was. 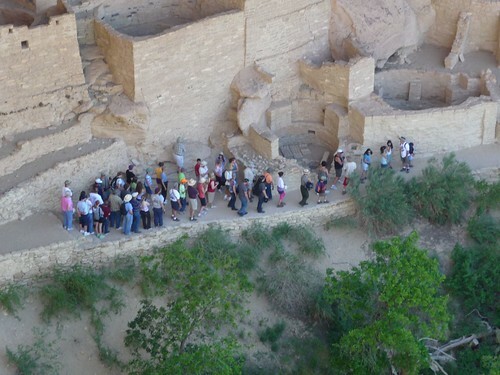 After the Cliff Palace tour, we climbed up the other side of the rock walls. 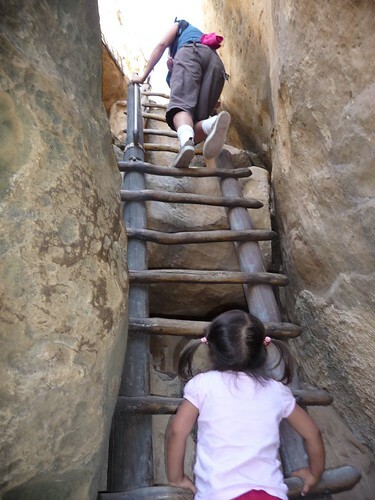 It was pointed out to us that if we looked up to the right side just before ascending the tall ladders, we would see what is left of the hand and foot holds that the Puebloans used to get up and down from the cliffs. I’d imagine that once you got to be an old resident at the Cliff Palace, you probably just didn’t leave this place any more. It would probably kill you getting up and down these sheer rock cliffs. Go Ava! If Mama can do it with Mila on her, you can do it too! Like I said, she had no problems climbing up and down these ladders. If anything, she probably thought they were awesome and fun. 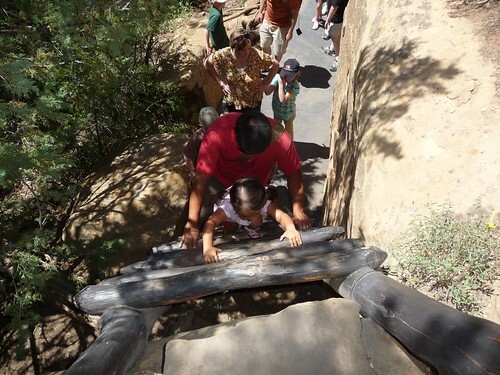 Back in the summer of 2000, a heat wave followed by a lightning storm sparked a juniper tree and caused one of the biggest fires in Mesa Verde history. 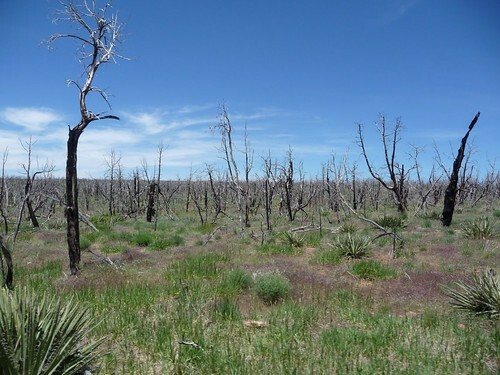 Over 20,000 acres of land was destroyed and much of the devastation still remains nearly 10 years later. As the day went on, we were starting to feel the heat as well. 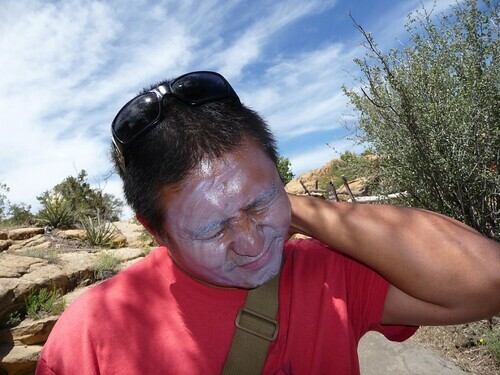 As the responsible tourists that we are, we knew that it is now time to reapply that sunscreen lotion. Once Ava was finally convinced that I am the guy behind this SPF 55 mask, we headed down to a self-guided tour of the Spruce Tree House. 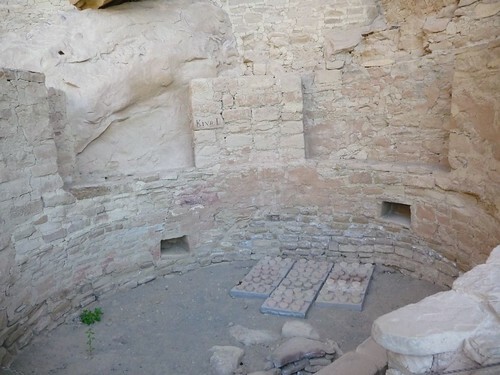 At the Spruce Tree House, there is a reconstructed Kiva that appears what we assumed that it once did when the Puebloans were still here. As opposed to the open tops of the circular rooms, there would have been just a small opening with a ladder that allowed people to go in and out. We made our way down just to get a little feel of what it might have been like. Just as we suspected. Small circular room under the ground. 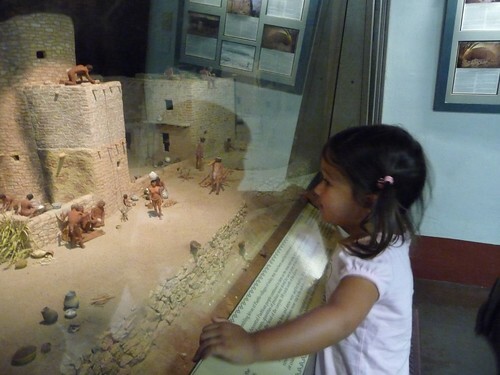 Inside the visitors center, Mesa Verde has a series of really nicely built dioramas the depict scenes of what it would have looked like between the 8th to 12th century. 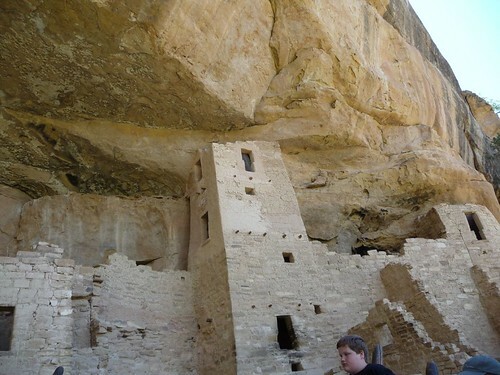 The history of the ancient Puebloans settling here in the Mesa Verde area is quite amazing to see in such a visual way. Even Ava thought it was cool that all these little dolls were running around with hardly any clothes on. All of these scenes are miniature versions of the actual locations right here in the park. 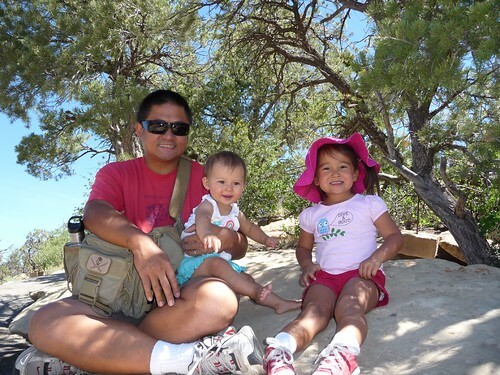 Complete with baby Puebloans. We wrapped up our visit at Mesa Verde with lunch at the cafe and saw this little number on the way back to our car. If you didn’t know what this is, you might just think you are looking at a garbage truck. 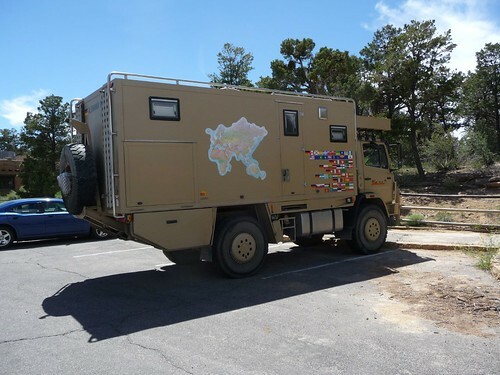 In reality, this is the Mercedes Benz Maxi-Mog. 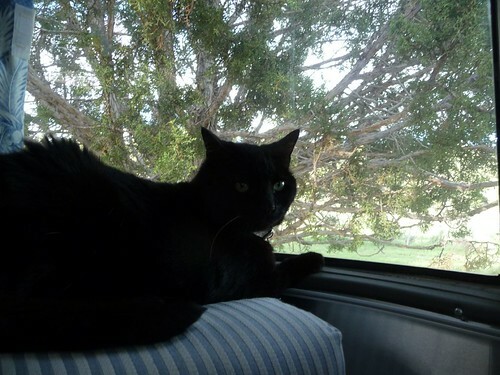 It is a completely self-contained RV that is designed to go anywhere. You might have seen RVs with the map of the United States on its side showing you when states the owners have been. This monster has the map of the world. And it has flags of all of the countries that it has been to. I guess there is always a bigger fish in the pond. 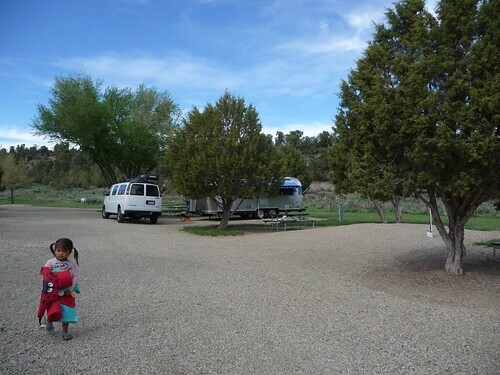 We got back to Mesa Verde RV Resort to take advantage of their amenities before heading out tomorrow morning. Ava got her bathing suit on to brave the frigid waters of their swimming pool. 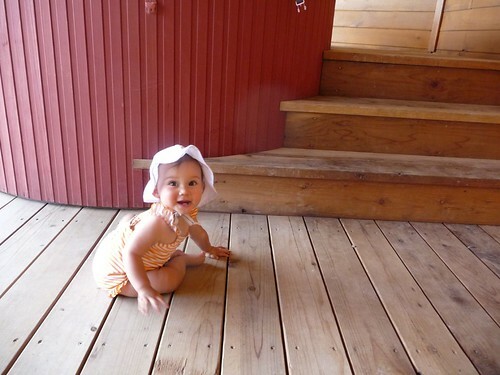 Mila also put on her bathing suit except she just crawled around the jacuzzi area which was good enough for her. 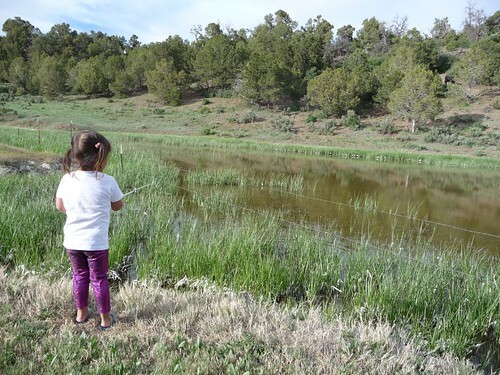 Ava is loving her Toy Story fishing pole and decided to toss it into this murky lake to try her hand at catching dinner. I don’t think there are many fish in this lake. Probably not much of anything from the way it smells. We decided to go to https://www.nitehawk.net/best-9-fishing-waders/, and purchase new fishing gear. Sorry Yoda, no fish for dinner. 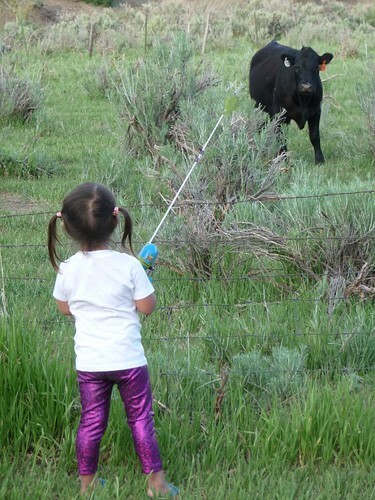 Ummm, Ava, I don’t think we are going to catch this one with your fishing rod. We had a beautiful day here at Mesa Verde and we are sad to leave tomorrow morning. There are just a few more days left of our adventure before we get home and we are going to make the best of it.